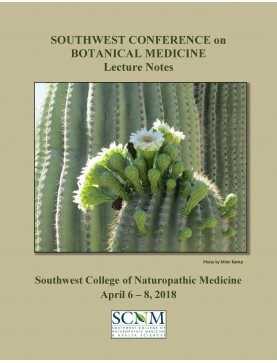 This annual conference at the Southwest College of Naturopathic Medicine in Tempe, Arizona, features some of the country’s most experienced herbal practitioners and teachers. Topics include botanical therapies for healthy aging, surgery preparation and recovery (including when surgery is contraindicated), lymphatic system health, pain syndromes (fibromyalgia, CRPS, arthritis), mood disorders in children and teens, hepatitis, depression, anxiety (and re-evaluating their causes), keeping kids healthy, insulin resistance and enhancing memory and focus. Other lectures focused on the best harvesting and medicine-making techniques for tinctures, syrups, oxymels and other preparations, and also included advanced therapeutic topics such as: Classical Herbal Pairs and Herban Legends/Clinical Pearls. Full listing of all recordings below. The printed book of lecture notes is available for $30. Available on Amazon.com. Interested in Continuing Education credits? Learn about Nursing CEU, CME for Naturopathic Physicians, and PDA CEU for Acupuncturists. Speaker: Jane Bothwell. Syrups are essentially a strong herbal decoction blended with honey or ..
Speaker: Christopher Hobbs. Science review includes latest clinical trials, meta-analyses, and ..
Speaker: JoAnn Sanchez. We consider how the chemistry of each plant indicates what medicine pre..
Panelists: Mary Rondeau. Continued from Part 1. Mood disorders in children are on the rise, with cur..
Speaker: Mary Rondeau. Mood disorders in children are on the rise, with current estimates of 20% of ..
Speaker: Jeffrey Langland. Part one features in vitro observations on the treatment of herpes s..
Speaker: Jane Bothwell. Familiarize yourself with the basics of preparing herbal tinctures (hig..
Speaker Katie Stage. There are many strains of the human papilloma virus (HPV). Low-risk strain..